Prepare barbecue or indoor grill pan to medium high heat and lightly oil the grill. Grill the pineapple slices until heated through and beginning to brown, about three minutes per side. It is important to leave the pineapples on the grill in order to create grill marks. While pineapples are cooking, whisk the mascarpone cheese and vanilla in a small bowl to blend and set aside. Combine the Nutella and cream in a small bowl and stir. Place in a microwave on high for about 2 minutes, stirring every 20 seconds to blend well or you can combine the Nutella and cream in a small saucepan over low heat and cook for about 5 minutes, stirring constantly. Heat until satiny smooth and easy to pour, about 3 to 5 mins. Transfer the slices to a large platter and drizzle with the warm Nutella sauce. Dollop the mascarpone mixture atop and sprinkle with the hazelnuts and serve. We know that 70% of our immune system is in our gastrointestinal (GI) tract. Stands to reason that with any body wide inflammatory response, we could start with the health of the microbiome in our GI. We carry about 2kg of bacteria and yeast within us that help digest food, convert vitamins to active forms, play a role in our immune response and aid in mineral and nutrient absorption. Scientist of late have also found that brain damage could possibly be treated by improving the health of the microbiome. Do you have what it takes? The healing is within. Individualized treatment plans are available with Dr. Laura M. Brown, ND – she is medically trained & naturally focused. When I was a kid, my dad made his famous cheeseburgers every Sunday during summer. He loved being outside in the late afternoon, manning the grill while my brother and I chased each other through the sprinklers. His burgers were thick, juicy, and all of my friends who got to taste them still talk about them. Thinking back, I can’t put my finger on what made them special, they were just ground beef, seasoned with salt and pepper, topped with a slice of yellow American cheese and served on a sesame seed bun. Perhaps it was because Dad formed them by hand, or he had figured out how to cook them perfectly, or we were kids and easy to please when dinner tasted better than a fast food patty. I’m grown up now, and so are my burgers. The place in my heart once reserved for a cheeseburger with ketchup is now home to a juicy turkey burger topped with avocado, grilled onions, and arugula. I’m constantly taste-tasting veggie burgers too, because they can be made with an exciting variety of ingredients, and no two taste the same. 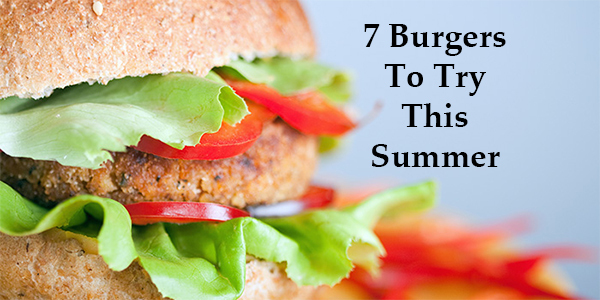 Luckily, burgers don’t have to be bad for you to be delicious. We’ve created seven tasty versions to try this summer, made with everything from beef or turkey, to savory veggie options. What is your favorite kind of burger? What toppings do you like best? Let us know in the comments. 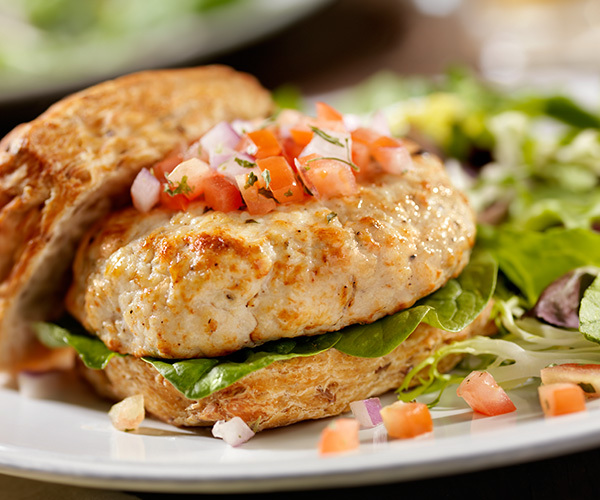 Our flavorful turkey burgers are seasoned with fresh herbs, Dijon mustard, and a dash of Worcestershire sauce. Tangy buttermilk is the secret to keeping them tender and juicy. Try these with chicken too! Get the recipe. 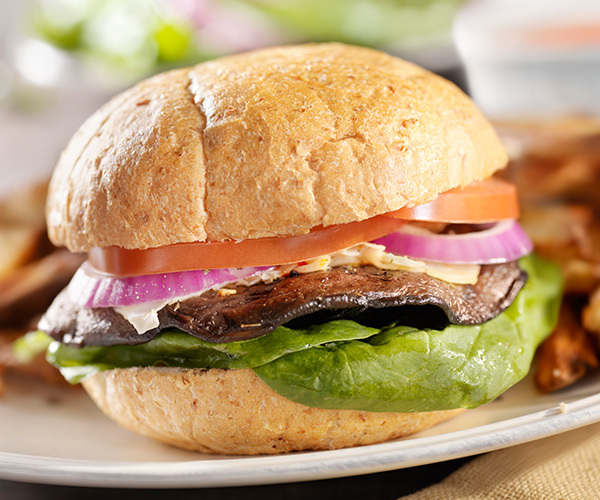 These hearty portobello burgers feature the gourmet flavors of garlic and balsamic vinegar, but, once marinated, only take minutes to make. They are a great vegetarian option for grilling season. Get the recipe. Roasted garlic and fresh rosemary make these burgers extra flavorful. Adding grated zucchini to the lean ground beef helps keep the burgers moist, and is an inexpensive way to add bulk. And, it’s almost undetectable, so it’s a clever way to sneak extra veggies into your diet. Get the recipe. 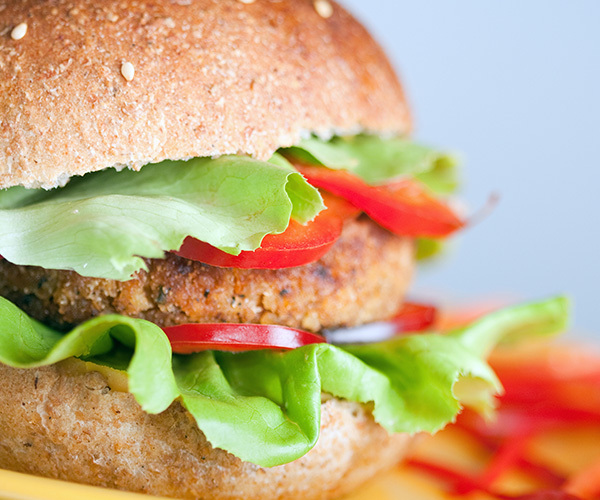 It’s easy to make your own delicious veggie burgers! 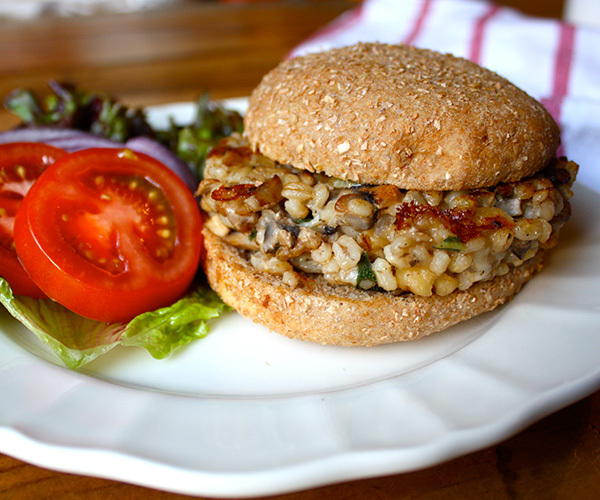 After you’ve tried these Mushroom Barley Burgers, you’ll say goodbye to frozen, processed patties. These get wonderful flavor from sautéed mushrooms, sage, and mozzarella cheese. Try other fresh herbs, like basil or oregano. Get the recipe. 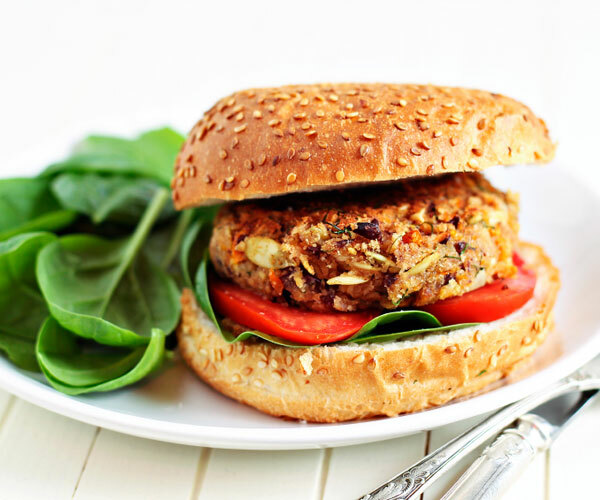 These black bean and brown rice burgers are vegetarian-friendly and packed with wholesome goodness. A hint of tomato, basil, and Parmesan cheese gives them an Italian twist. Get the recipe. 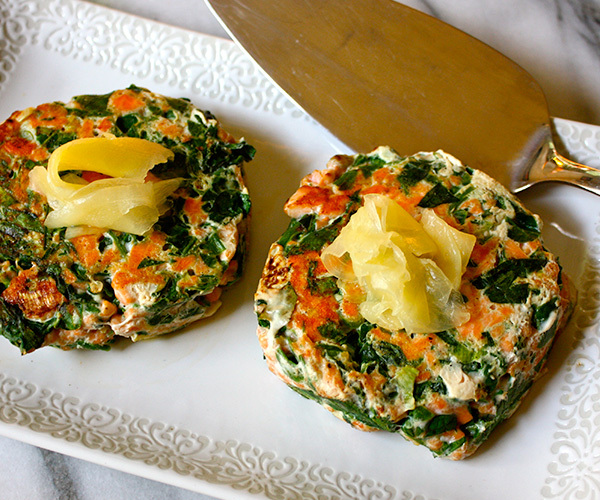 We like that each of these Spinach Salmon Patties has a full serving of vegetables. 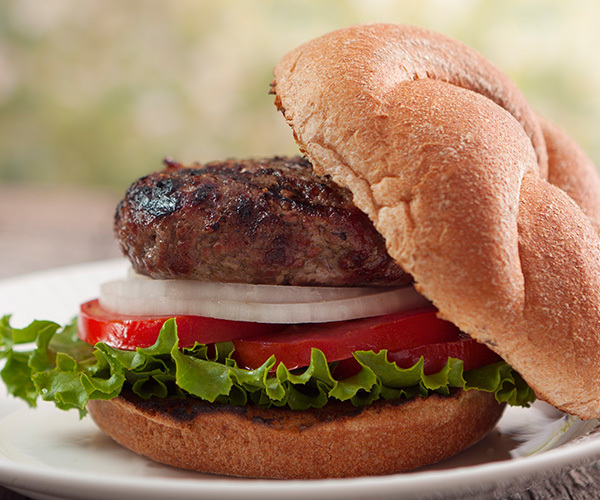 They are chock-full of flavor and are an exciting alternative to turkey or beef burgers. Pickled ginger makes a perfect topping! Get the recipe. Make it meatless! These tofu burgers are a delicious veggie alternative to beef or turkey burgers. Ginger, garlic, sesame, and soy sauce add tons of flavor, and toasted almonds give them a nice crunch! Get the recipe. Although summer may be your favourite time of the year to run, the scorching heat and humidity can take a dangerous toll on your body if you’re not careful. Here are 5 handy tips to help you stay safe and keep from overheating. Despite the heat, mosquitoes and humidity, there are plenty of benefits to running in the summer: for one thing, longer daylight hours means more opportunity to be outside. For another, people tend to be more active and chances are your fitness level is higher. Even so, the danger of overheating is always around the corner. So what can you do to prevent it from happening? Temperatures and humidity levels tend to be lower early in the morning, so you’re likely to get a higher quality run in at this time of day. Waiting until later in the day means running when it’s hotter outside, and this exposes you to greater risk of overheating. It can be easy to talk yourself out of getting up early for a run or to try to avoid running in the heat altogether. So make a plan to run with a friend. This not only makes the run more enjoyable, but it also keeps you accountable. Staying hydrated is one of the most important things you can do to keep your body healthy when running in the heat. Drink lots of water before during and after your run. If you’re going to run a race, start hydrating your body a few days ahead of time. All of that water, however, could wash electrolytes out of your system, so occasionally mix a sugar-free electrolyte mix in with your water. Wearing a hat shades your eyes and face, and keeps the sun from beating down on your head. Sunglasses also protect your eyes. Be sure to apply sunscreen to protect your skin from the sun’s harmful rays. Lowering your core temperature ahead of time helps your body to cope with the heat better during the run. Cool your core with ice packs stuffed down your shirt or sports bra in the front and back. Also, there are lots of blood vessels in your wrists, so pouring cool water on them or holding ice to them sends cooled blood throughout your system. Even if running in the heat isn’t your favourite thing to do, there are lots of ways to do it safely and make it more enjoyable. The theoretical risks associated with wearing an insect repellent should be weighed against the reduction or prevention of the risk of fatal or debilitating diseases including malaria, West Nile, Zika, Dengue/Yellow fever, Lyme and filariasis. Best way if you have to go out doors is to wear loose fitting, light coloured, full length pant and sleeve with tall socks or pants tucked in. Nets are available for over the head and face. If you are in the deep woods and are at risk for disease, you may consider the very strong (and poisonous) option of DEET, but be sure to avoid the face, eyes and mouth and wash your hands afterward in order to additionally help avoid contact with nose, eyes and mouth. After you return indoors you are best to wash completely with soap and water. Know that the long term exposure to DEET can lead to memory loss, headaches, weakness, fatigue, muscle/joint pain, nausea, tremors, and shortness of breath. This is because DEET is actually a pesticide and your skin will absorb it. What are some alternatives to DEET? Picardin: Structurally based on chemicals in pepper, it appears to interfere with the mosquito’s ability to smell its prey. The chemical is extremely effective for some species of mosquito (including important disease-carrying mosquitoes such as A. aegypti), but is less effective for other species that don’t appear to rely on smell, so overall it may be somewhat less effective than DEET. A 20% Picaridin formulation has been shown to repel mosquitoes for 8-10 hour. Vitamin B1 – Thiamine – Take a dose of B1 daily and mosquitoes avoid you when you smell like a vitamin! Fill with water and shake. Apply & re-apply as needed. Mix Baking soda (sodium bicarbonate) with water to form a paste and apply to bee stings, poison ivy rash and insect bites. Oatmeal: crush up oats and make a colloidal oatmeal paste with a little water and apply to itchy rashes or insect bites. Apis Homeopathic 30 C 2 pellets under tongue every 15-30 min until relief, up to 3 hours. Then as needed 2 pellets /3x per day up to 3 days. Indicated in conditions hot, red, inflamed, swollen, itchy insect bites & bee stings. Always do a check for ticks on your skin after trail walks and hikes in long grasses. Carefully remove from the skin at the tick’s head and mouth area using a pair of tweezers. Save the tick for testing. Wash the area with mild soap and water. Ticks have the potential to carry Lyme, Rocky mountain spotted fever, Tularemia, Ehrichiosis, Relapsing fever, Colorado tick fever and Babesiosis. In any case of bug or tick bite followed within a few days of feelings of flu like symptoms, fever, headache, nausea, vomit or fatigue, see your health care provider immediately as you may need a course of antibiotics to prevent long term sequelae of insect borne diseases. Information in this post does not constitute individual medical advice. Readers apply this information at their own risk. Please seek care from your health care provider for professional and individual advice. Dr. Laura M. Brown, ND.